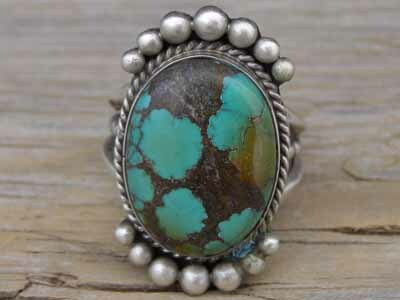 This ring by Navajo silversmith Rita Touchine is set with a pretty oval stone of Chinese turquoise. The stone is set in a smooth bezel wrapped with twist wire and arcs of graduated raindrops frame the stone above and below. The shank of the ring is made from two lengths of triangle wire fused with a length of raindrop wire. Hallmarked Rita Touchine in script and stamped Sterling on the ring back. Ring face: 1 1/8" x 11/16"